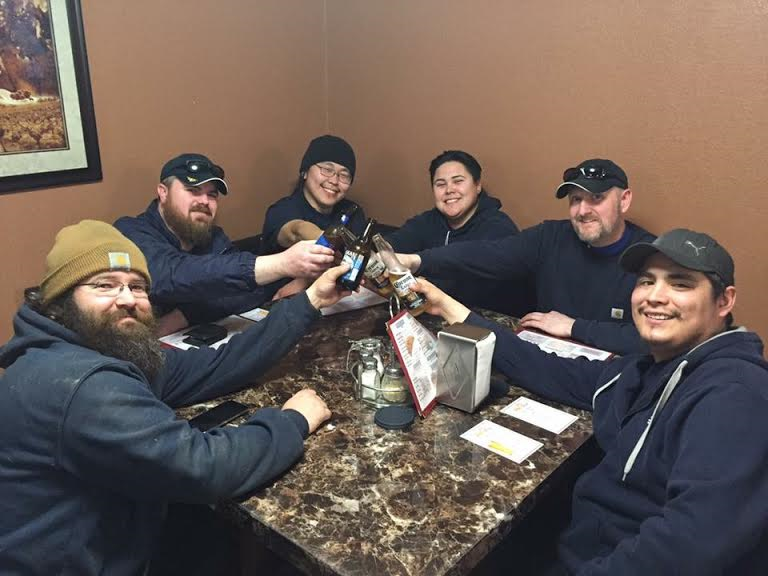 WAIPA IN REAL LIFE: FILI'S PIZZA RESTAURANT NOW SERVING ALCOHOL BEVERAGES IN BETHEL, ALASKA!!! HAPPY ALOHA FRIDAY!!! FILI'S PIZZA RESTAURANT NOW SERVING ALCOHOL BEVERAGES IN BETHEL, ALASKA!!! HAPPY ALOHA FRIDAY!!! WELL TODAY WAS A BEAUTIFUL SUNNY DAY FOR THE MOST PART AND I DEFINITELY TOOK ADVANTAGE OF THAT!!! YES... ANOTHER BEAUTIFUL WALK ALONG THE HIGHWAY IN BETHEL, ALASKA!!! STARTING NEXT WEEK I'LL START DOING WALK & JOG INTERVALS AND WORK MY WAY UP!!! LOADING AND MOVING "ULD"... I'LL GET BETTER THE MORE I PRACTICE... :) IT WAS ACTUALLY FUN!!! ITS REAL, THEY NOW SERVE ALCOHOL BEVERAGES AT THEIR PIZZA PLACE!!! AND MY AWESOME RAMP CREW WENT AHEAD AND CHECKED THEM OUT!!! ITS NICE TO KNOW THAT NOW THERE IS A PLACE TO COME AND HAVE AN ICED COLD BEER AFTER WORK AND HANG OUT WITH CO-WORKERS, ALASKA AIRLINES CO-WORKERS TO BE EXACT. FILI'S PIZZA IS NOW SERVING BEERS & PIZZAS!!! STOP BY AND ENJOY THE MOMENT!!! COLE... WE MISS YOU BRO, HURRY UP AND COME BACK FROM YOUR VACATION SO YOU CAN JOIN US!!! SO THAT ABOUT SUMS IT UP FOR ME!!! I DON'T KNOW WHAT THIS WEEKEND HAS IN STORE FOR ME... YOU ALL HAVE TO WAIT UNTIL NEXT WEEK WHEN I UPDATE AND SHARE MORE COOL AND FUN STUFFS!! !